Hardwood windows & doors are constructed using finger type mortice and tenon joints and are PVA glued to form a strong bond. Minimal maintenance is achieved by using a micro-porous sealant which allows the beauty of the wood to show through, yet shields the timber from ultra-violet rays, protects it, and allows it to breathe. All Abbey Glass & Burton Glass Hardwood windows and doors are available in an extensive range of traditional wood stains to suit all tastes, including National Trust and Heritage colours. Every Hardwood window is manufactured to our customers specific requirements, so whether it's regular Casement or Flush fitting to satisfy conservation area restrictions, with or without Dummy Casements, We have the solution! To compliment our exclusive Hardwood range we offer an extensive collection of Window and Door locking handles covered by our Fully Comprehensive Ten-Year Guarantee. Contact Abbey Glass for more information. We would like to say how pleased we have been with experience from start to finish. The windows are of excellent quality and look even better than expected. Your sales guy was very professional, polite and helpful, as were the fitters. There was virtually no mess and took great pains to leave everywhere clean and tidy. We would have no hesitation in recommending your company to anyone requiring replacement windows. 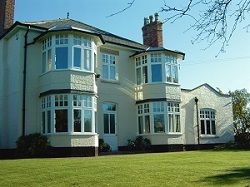 The windows and doors recently fitted are splendid and the workmanship superb. Not only do they look fabulous they have added value to my property. Thank you so much to all at Abbey & Burton Glass.